Context & Problem: Since 2008 we have a business phone and internet access contract with Optima Telekom croatia ( http://www.optima.hr/ ). The internet link was served by an ADSL Huawei Smartax MT-880 device, that was supplied by Optima. Some days ago, there was a storm, and the Huawei router broke. Had a call with Optima tech support, but found that the supplied router is out of warranty, and that the suggested option they propose is a contract upgrade, with a higher monthly cost and a new router. 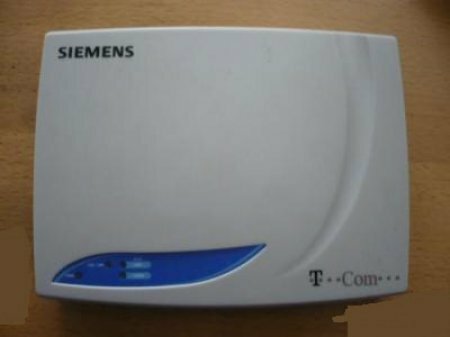 Solution: reuse an old T-COM Siemens ADSL C-010-i router, to connect to Optima ADSL line, with proper reconfiguration. 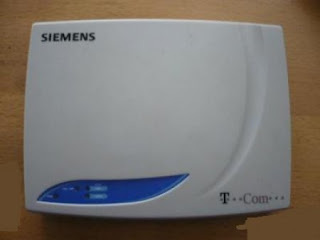 I had an old T-COM router, sitting there, a Siemens ADSL C-010-i, with Conexant chipset. This device has just a LAN RJ-45 port and a RJ-11 ADSL WAN port whose cable goes in the ADSL splitter. According to some documents I found on the internet, this device also have an internal USB port which is only accessible opening the case (which I did not do). from a previous installation, and I decided to try to use that. Had a look on the internet, and another call with Optima tech support. Optima could not support me in reconfiguring the device, because is not among the one they support. After many hours of fiddling, i managed to have it working, and now I am sharing here the settings with which I had it working. The Siemens C-010-i default factory configuration is at ip 192.168.1.1/24, with http username and password being admin/epicrouter. There is a small button that allows to set it back to factory configuration. My Siemens unit has probably been manufactured before 2008. With these settings, the line got up again (after some moments post modem reboot, ADSL line light stops flashing and becomes steady green). After these settings, and after a router restart, this is what I got on the system log. 01/01/1970 00:00:00> PPP1 Session is up. 01/01/1970 00:00:00> No Static Session Information is defined. 01/01/1970 00:00:00> PPP1 PPPoE Session is established. 01/01/1970 00:00:00> CfgMgr: 'Prism.dlz' module loaded. 01/01/1970 00:00:00> CfgMgr: 'Apimage.dlz' module loaded. 01/01/1970 00:00:00> CfgMgr: 'Washer.dlz' module loaded. 01/01/1970 00:00:00> CfgMgr: 'ShtmMib.dlz' module loading failed. 01/01/1970 00:00:00> CfgMgr: 'Shtm.dlz' module loaded. 01/01/1970 00:00:00> Initialized Dynamic NAPT. With these settings, I found that some downloads are aborting, and speed tests reports give inconsistent results (albeit browsing speed does not seem that bad). In particular, speedtest.net gave consistently very poor results in speed measurement, reporting about 0.07Mbit/sec download speed and 0.15Mbit/sec upload speed. After these settings have been put in place, and after a router reset, I did not experience anymore failed downloads, and got much better speed measurements, and browsing speed is better too.